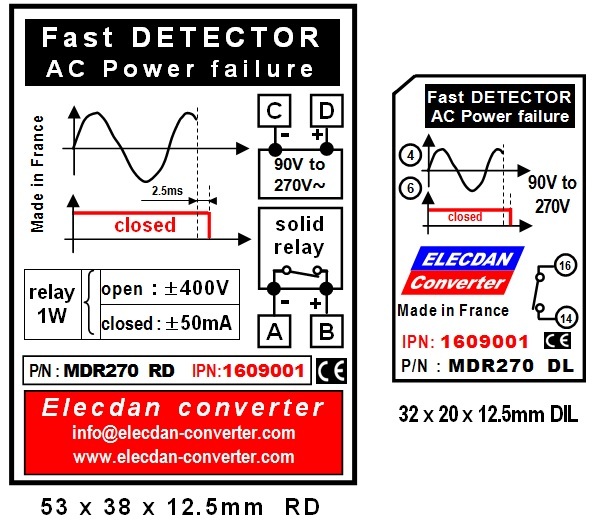 This power failure detector is self-powered by the AC power that it monitors (90 to 270 V / 48 to 60 Hz). 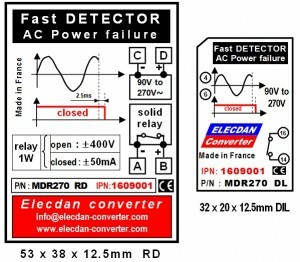 In less than 2.5 milliseconds, this detector warns the user that the AC power disappeared (power failure or micro-cut). The output of this detector is isolated from the input (> 4000V DC) and embeds a 1W bipolar static relay, open or blocking. This relay supports ± 400V (blocking) and a current rate of ± 50mA (open). Upon request, we manufacture detectors with other voltages, additional functions, or personalized presentations.